Boosting Abe’s political fortunes as his domestic approval ratings have declined precipitously in the wake of influence-peddling and other scandals, which have seriously threatened his ability to remain in office. …confirmed their commitment to achieving the permanent and verifiable denuclearization of North Korea. They also reaffirmed that North Korea needs to abandon all weapons of mass destruction and ballistic missile programs. President Trump and Prime Minister Abe underscored that the global maximum pressure campaign will continue until North Korea denuclearizes. President Trump and Prime Minister Abe reiterated their strong commitment to boosting trilateral cooperation with the Republic of Korea in the face of the North Korean threat and coordinating closely in advance of U.S.-North Korea talks… President Trump affirmed that he will urge North Korea to promptly resolve its abductions of Japanese citizens, recalling the strong impression he received when he met the families of the abductees during his visit to Japan last November. As a result, the Japanese press has generally characterized the Mar-a-Lago summit as a success for Abe, but polls over the weekend show a slight drop in his approval ratings because the trip was overshadowed in the Japanese press by a sexual harassment scandal involving the top bureaucrat at Japan’s Ministry of Finance. Meanwhile, his other scandals remain unresolved, and calls for Abe to step down have been increasing, with former Prime Minister Koizumi suggesting Abe resign at the end of the current Diet session in June. Moreover, in addition to talks on North Korea, the Abe-Trump summit covered bilateral trade issues. 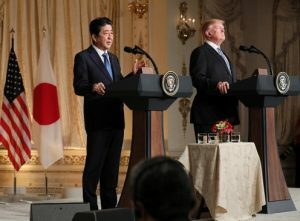 Trump pointed to the “massive” US trade deficit with Japan at a news conference with Abe, and emphasized the need for free, fair and reciprocal trade deals between the US and Japan. Trump’s impulsiveness in making and changing critical decisions that affect America’s closest allies, and Trump’s vow to put America first, have also led to questions in Tokyo over the durability of the results of the April 17-18 summit. In that context, Japan has been exploring other avenues to advance its interests on North Korea, including attempts to work more closely with China. Just before Abe departed for Mar-a-Lago, Japan and China held their first high-level economic dialogue in eight years (resulting in a pledge to accelerate negotiations on both a Japan-China-South Korea free trade agreement and the China-led Regional Comprehensive Economic Partnership) and agreed to pursue a broad improvement in bilateral ties through reciprocal visits to each country by President Xi and Prime Minister Abe. On North Korea, Japan and China agreed to take a concerted approach—including enforcement of UN sanctions—to prod North Korea toward complete, verifiable and irreversible abandonment of nuclear weapons. So, while the Abe-Trump summit at Mar-a-Lago appears to have reaffirmed that the Washington and Tokyo are united in their approach to North Korea, Japan is taking nothing for granted. While Abe hopes and expects that Trump will follow through on his pledges regarding his summit with Kim, Japan is taking other steps to advance its interests and address the threats posed by Pyongyang.